Aeration is an effective chemical-free method of preparing water containing iron and hydrogen sulfide for filtration. Exposure to air “oxidizes” the contaminant to a filterable form (ferric iron or elemental sulfur), then an appropriate filter removes the contaminant from the water. Closed tank aeration for residential treatment is available in several formats. The least expensive, though not necessarily the simplest, uses a small venturi that is installed in the water line itself in front of the well’s pressure tank. As water fills the tank, air is literally sucked into the water stream via the venturi. A small treatment tank where “oxidation” occurs follows the pressure tank. The water then goes to a free-standing filter for final filtration. 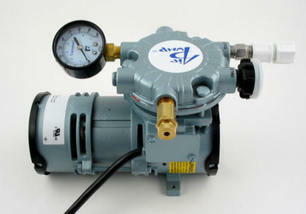 A much more aggressive treatment uses a small air compressor, or “air pump,” that injects air into a treatment tank. When water enters the tank it falls through a pocket of compressed air where rapid oxidation occurs. The water then passes on to a filter tank for final removal of the contaminant. Single tank units are the simplest form of aeration treatment. Single tank systems perform the aeration and filtration in a single tank. Water enters the tank, falls through a pocket of compressed air, then is filtered by the media contained in the lower 2/3 of the tank. Single tank units need no pump; they bring in air during the nightly regeneration performed automatically by the control unit.